When I received an email signed “Seeka You”, I assumed that this was a rather odd pseudonym used by someone reluctant to give their real name. I was accordingly disinclined to expend time and effort on a reply. But the person in question assures me that this is their true name. Anyhow, he/she had a question about intonation, which I had earlier failed to answer when it first reached me immediately after my stroke (at which time I was in no state to answer it). 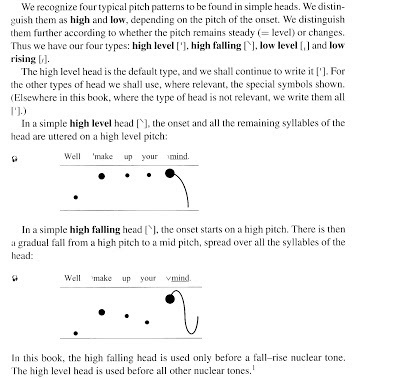 In your book English Intonation, you follow the principle that “the high falling head is used only before a fall-rise nuclear tone” and “the high level head is used before all other nuclear tones”. I’ve listened closely to RP speakers in different styles of speech, and I can't seem to avoid the impression that most of the time (70%? 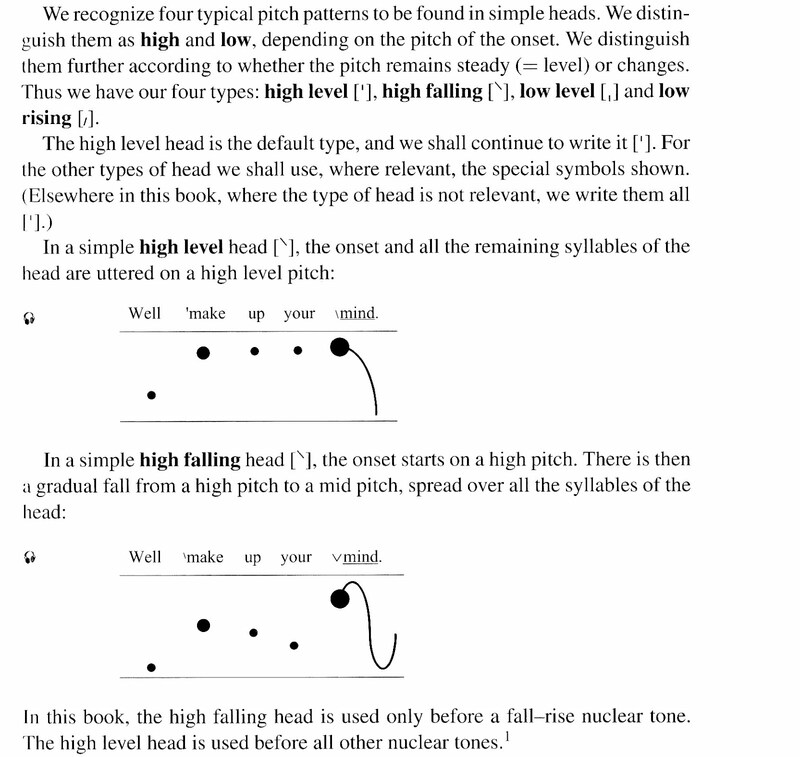 ), they use a falling head regardless of the nuclear tone; using a high level head seems to be very formal and infrequent even in fairly formal speech. Is my perception incorrect? To explain: The head is the piece of the intonation pattern that extends from the first accent up to but not including the nuclear accent. Prenuclear patterns (and therefore heads) are one of the less important phenomena in the intonation of English (they don't seem to encode much meaning), and I therefore relegated the whole matter away from the core chapters of my book to chapter 5, “Beyond the three Ts”. I think the last two sentences constitute a pedagogically justified simplification of the complex reality. In recording the copious spoken examples that accompany the text we found it easy and authentic-feeling to conform to it. The footnote to the last sentence you see above reads as follows. But I am not aware of any corpus-based analysis that would enable us to judge whether this pedagogical simplification deviates seriously from actual usage. So I told S.Y. I don't know. It’s an empirical question to which neither you nor I know the answer. There’s perhaps also a question of definition: how much of a downward deviation from level has to be present in a high head before we categorize it as ‘high falling’? I certainly don’t feel that high falling heads (as I perceive them) fit naturally for me before anything other than a fall-rise. I might have added that this is in all likelihood one of the things that varies considerably between accents. High falling heads before a high-fall nuclear tone (which S. Y. claims to be so usual) would put me in mind of a Highland Scottish accent; they don’t feel at all right for my own speech. In pe\NINsular Spanish commands, I mean. "Spanish commands" sounds awful... Er, I hope I'm not causing trouble with the link, as happened last Monday -It wasn't my fault, surely? Hello, I have recently discovered this blog and I found it really helpful. I am studying to be a Tecaher of English, so I am still learning, and your works and dictionaries are very useful.